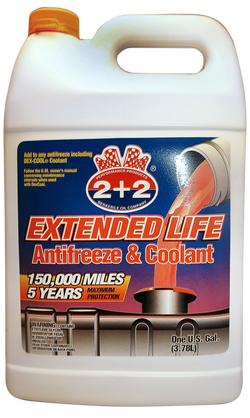 BERKEBILE 2+2® EXTENDED LIFE ANTI-FREEZE/COOLANT... utilizes the latest technology in corrosion inhibitors and meets or exceeds performance requirements for truck, car and HVAC systems including those with aluminum heat rejecting components. This product is compatible with all products from major producers intended for use as a coolant. Add to all long life antifreeze products including GM DEX-COOL and regular antifreeze. This product has no adverse effect on hoses, gaskets or finishes. Typical Composition: Ethylene Glycol 95% by weight, Propriety Corrosion Inhibitors/water mixture 5% by weight. This product contains no silicates, no phosphates, no nitrites, no borates and no amines. Metal corrosion loss data in mg. Per test sample.